A big breakthrough for St. Helens boys basketball came Tuesday at Glencoe and in the Lions' fourth game of the season. St. Helens beat the Crimson Tide 54-43 for its first win under new coach Zach Waldher. The Class 5A Lions executed well. First, they solved the Glencoe full-court press. Then, they hit half-court shots over the Crimson Tide's zone defense. The Lions had the lead most of the night and were in front by as many as 16 points against the 6A Hillsboro school. It was a happy bunch of Lions in the postgame locker room. "The guys went pretty crazy when I got in there," Waldher said. "Some guys were spraying water bottles on me, all in good fun." The Lions have an almost entirely new rotation this season and have no returning starters as they adapt to their new coaching staff. St. Helens had lost its first three games, in order, by 44 points at Silverton, by seven at home to Dallas and by 29 at home against Redmond. A meeting of the minds — Waldher sitting down with team captains Canon Beisley, Parker Miller, Hunter Wetherbee and Chris Beatty — helped bring some strategies and goals into clearer focus and led to a few tweaks in game approach. Waldher said the adjustments that came out of "our little state of the union talk" paid off at Glencoe. "We sat down and talked about expectations," Waldher said. "The kids' main point to me was they're enjoying the style of ball we're playing but they just aren't used to it and we need to go back to the basics. 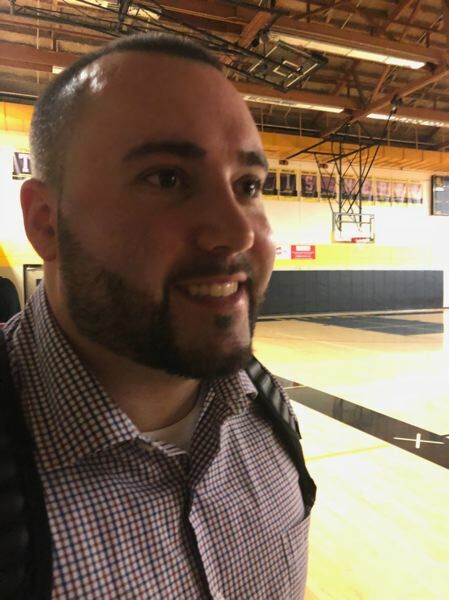 And they expressed how they don't want to end their season going out with more losses than wins, that they want to end their careers getting the program on the right track." The Glencoe game started innocently enough for the Lions. St. Helens trailed by six points early and was down by one after the first quarter. But, a couple of baskets each from seniors Beatty and Ryan Hastings helped turn the momentum in St. Helens' favor. In the second quarter, freshman point guard Trevor Fitzgerald set up junior Gavin Knoke for three consecutive scores that helped the Lions take the lead. Meanwhile, senior Wetherbee was filling up the stat sheet in the 6-3 center/forward's first start. "We switched around some rotations, and he was just a terror," Waldher said. "All night he was like the man of the hour." Wetherbee wound up with 14 points and 13 rebounds, and he took two big charges late in the game. "He was a monster," Waldher said. Knoke, a guard/wing, finished with 18 points, hitting shots from the top of the key, the corner and elsewhere. He also had three assists. "He played a good all-around game and let the game come to him," Waldher said. Still, Glencoe (0-6) made a run, pulling to within three points. Beisley, who was shifted from a lot of point guard duties to playing more off the ball in the backcourt, hit a couple of key shots late in the game to help the Lions pull through. He finished with eight points and four assists. Waldher especially liked that his team had 19 assists with only 11 turnovers, a big improvement in the latter category especially. The Lions have five nonleague games left before opening the Northwest Oregon Conference season against always-tough Wilsonville, which is 3-0 and ranked No. 1 in the state by 5A coaches. Rainier, fresh off a 13-0, 3A football championship season, comes to town for a 7:15 p.m. Friday game. "We're excited to come back to our own gym," Waldher said, "but Rainier is going to be a good test for us."